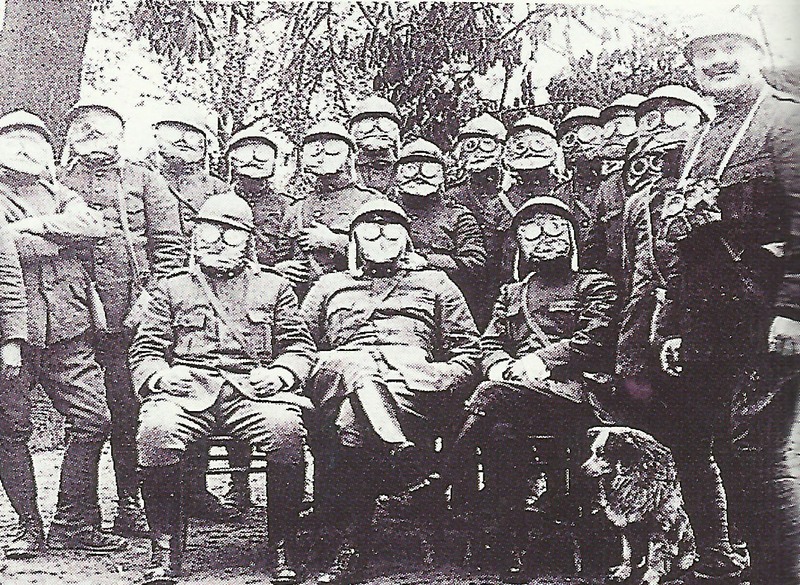 Italian ambulance soldiers with gas masks. Trentino: Italian cavalry reach Pedescala northeast of Arsiero. Isonzo – First major gas attack on Italian Front (until June 29): with help of hydrocyanide gas shell Austrians inflict 6,600 casualties on sleeping Italian 21st and 22nd Divisions between Mt Cosich and sea in night raid before Regina Brigade and 10th Regiment regain trenches, but Austrians lose 1,988 (416 PoWs) men including gas fatalities from blowback. Verdun: French grenade attacks near Hill 329 and Thiaumont Works. German counter­attacks fail. Somme: Zero day for Allied offensive postponed until 1 July (rain). Brusilov offensive, Galicia – Battle of Kolomea (June 24 to July 6): Lechitski shatters Austrian Seventh Army on 25-mile front east of Kolomea, taking 10,421 PoWs and 4 guns; enters Kolomea on June 29, reaches 12 miles south until June 30. Arab Revolt: 3 British ships land 8 Egyptian mountain guns, 4 MGs and 3,000 rifles at Jeddah. Persia: Baratov’s 8,500 men and 14 guns hold Turk 2nd Division at Karind until night retreat on Kermanshah (evacuated on June 30). Lake Victoria: 320 British soldiers land and occupy Bukoba. Western Front: Heavy rains and low cloud until June 30 restricts operations. 111 Royal Flying Corps personnel casualties since June 1 and 17,000 hours flown. Britain and France completely abandon London Declaration. Russia: CoS Alexeiev suggests to Tsar a military dictator for supply. Germany­: Liebknecht given 2 years hard labour (increased to 4 years on August 23) and dismissed from Army; 55,000 workers hold 3-day protest strikes. Britain: 400 German firms reported still trading.